Disturbing details were released today regarding the Baltimore County grand jury indictment against Terrence Cody. The NFL player, who was cut from the Baltimore Ravens last week, is facing 15 charges, including two felony aggravated cruelty charges involving his dog. The five misdemeanor animal abuse counts are for inflicting unnecessary suffering or pain on his dog; not providing his dog with nutritious food in sufficiency quantity; not providing proper drink; not providing proper space; and not providing necessary veterinary care. 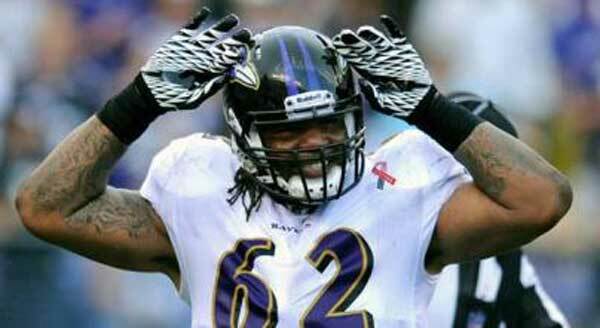 But an unidentified source told Aaron Wilson, who covers the Ravens for the Baltimore Sun, that Taz was severely underweight. “Dog that died owned by Terrence Cody was roughly 50 pounds, should have had a body weight at least twice as high, per source,” Wilson tweeted today. The source said a bone was discovered in Taz’s stomach, which may have been causing him not to eat. Taz died shortly after he was finally taken to a veterinarian. If Cody is convicted, he faces a maximum of six years in prison and up to a $5,000 fine for the felony animal cruelty counts, and up to 90 days in prison and a maximum $5,000 fine for the five misdemeanor counts. He is also charged with misdemeanor animal abuse and neglect counts related to his pet alligator. Cody could also be disciplined with a suspension or fine under the NFL’s recently toughened-up personal conduct policy. “If another teams signs him, he would be held accountable under the policy,” NFL spokesman Greg Aiello wrote in an email to the Baltimore Sun. Cody is free on $10,000 bail. He has not commented on the charges, and has not yet been assigned an arraignment or court date.